Add an element of luxury to your vacation on a private 3-hour yacht cruise from Puerto Colon. On a luxury vessel, you’ll enjoy activities such as snorkeling, swimming, and whale watching (weather and luck permitting) while taking advantage of an open bar and buffet. Plus, you’ll learn about Tenerife’s bio-diverse marine life from your captain and skipper. Hotel pickup and drop-off are included. The listed price does not include a 1.20€ Hour parking fee, payable at the time of tour check-in. Your indulgent experience begins with pickup from your Tenerife accommodation at 10:30am, when you’ll board an air-conditioned vehicle destined for port of Puerto Colon in Costa Adeje. On arrival, you’ll board a luxurious yacht and receive a safety briefing and orientation from your skipper and crew. Then, with a drink from the open bar in hand, you’ll set sail on the North Atlantic Ocean in search of whales and other marine life. 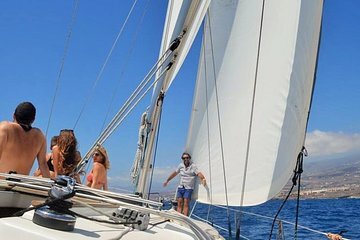 Stop intermittently to swim in secluded bays and snorkel with diverse marine life, and let your crew snap photographs of you from aboard the yacht. Plus, throughout the cruise, you’ll have access to an open bar and be served food sure to keep you revitalized throughout the day. Your tour concludes with drop-off at your Puerto Colon hotel.